In the 70s, "crock pots" were a staple of wedding registries, and today's versions are so advanced that they're still one of the more useful gifts you can receive. Hamilton Beach's slow cooker lets you program by time or temperature and automatically switches to warm when the food is done. Get ready to start searching Pinterest for the best recipes! It can be a hassle making coffee, but daily java runs can get expensive. Keurig has revolutionized the caffeine market with its mess-free, single-serve coffee maker. Those cute K-cup pods come in hundreds of flavors, including name brands like Starbucks, Dunkin Donuts and Gevalia. Have you ever thought about how great it would be to have a personal assistant? Now you can, thanks to today's technology. Amazon's Echo family of devices has styles and price points to meet any needs. Part of the fun of being a couple is documenting all those shared experiences. The GoPro HERO 5 takes such vivid pictures and videos that you'll think you're actually reliving the moment. The durable camera is waterproof and has a battery life of 60 to 90 minutes. Now that home decor is going from "yours" and "mine" to "ours," you'll want to add artwork that represents your mutual tastes. With UGallery you can register for the specific pieces you want, and guests can go in together on a gift. 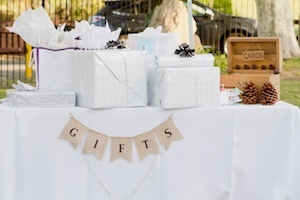 As a bonus, you get 15% off any purchases made within six months of your wedding. Just imagine post-work evenings with your spouse as you relax on your patio or balcony in your new outdoor furniture. Choices can include a charming bistro set or comfy chaise lounges with a side table in between. A set of tools may not sound like the most romantic gift, but you'll be thankful that you thought ahead when you're hanging pictures, assembling furniture or working on minor repairs. If you like to entertain, a bar cart is invaluable. Bring it out when guests are over, then tuck it off to the side as decoration when they're gone. Bar carts come in an incredible range of styles, from vintage and retro to sleek and contemporary. It's almost impossible to have too many bath towels, and one (or both!) of you may be bringing along towels that have seen better days. Use this opportunity to get a luxurious new set in the material, color and style of your dreams. Any other must-have items to add to the list? Share them with us in the comments!